Movienizer 10. 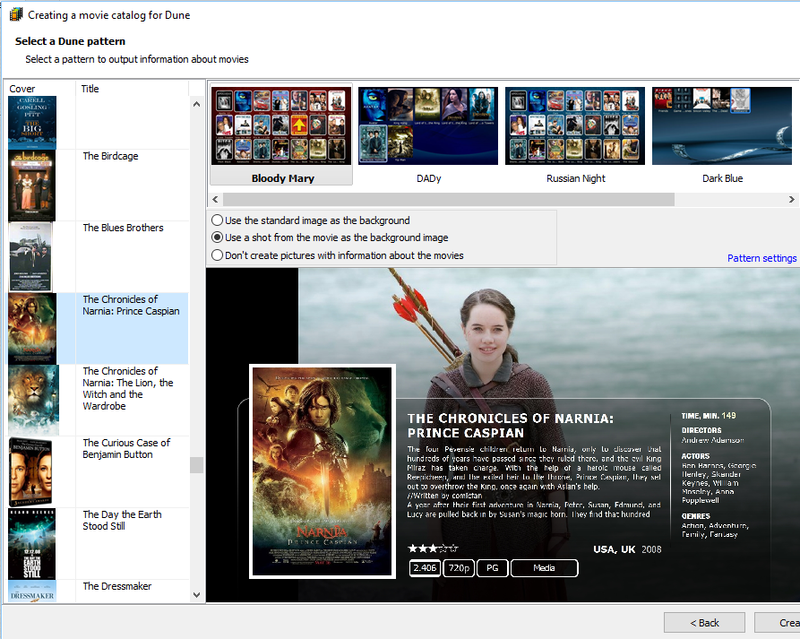 New features and improvements in the movie organizer. [!] Improved speed: works with the large database several times faster. [+] New field is available in reports: comments. [+] Added the lookup feature when selecting values from lists. When you add people, movies and other values in the new version of Movienizer, the list automatically scrolls itself according to the already entered letters, which helps select the required value easily. [+] Plugins are now provided with correct registry access. After moving to the new engine, certain difficulties with plugins were discovered. In Movienizer 9.2, new features were added to work with Windows registry, which removes these difficulties. [*] User interfaces have been updated. The program comes with three different interface themes. Interface scripts were fixed and improved, default settings were adjusted according to user requests. [*] The "Info about persons" window remembers the number of people that are to be pre-selected automatically. When browsing a movie page, you can click the "Info about persons" button to download information about several people from the list at once. 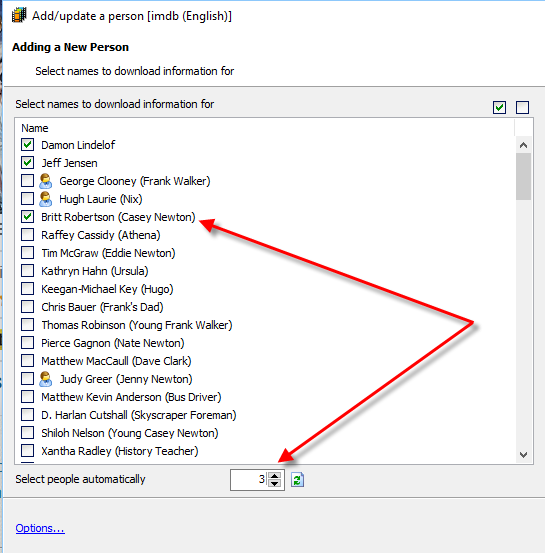 By default, the program also selects a certain number of people automatically when you open the download window. This number can be adjusted, but Movienizer 9.1 kept your new value only during the current session. Movienizer 9.2 remembers the custom value and uses it next time, too. 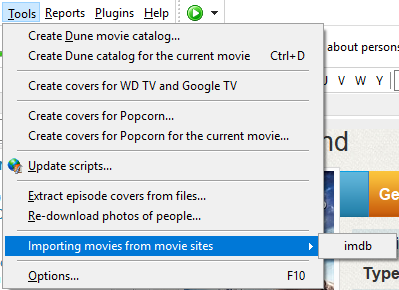 [*] Updated plugins that import movie details from other catalog programs. 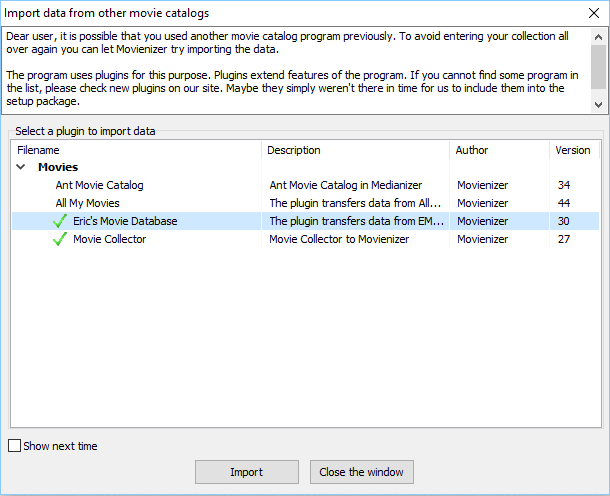 Movienizer 9.2 includes the latest versions of plugins that import data from other movie catalog programs, taking into account the latest versions of the corresponding programs. [-] Fixed the portable version. In Movienizer 9.1, certain issues with the portable version were discovered. These issues were fixed in Movienizer 9.2. 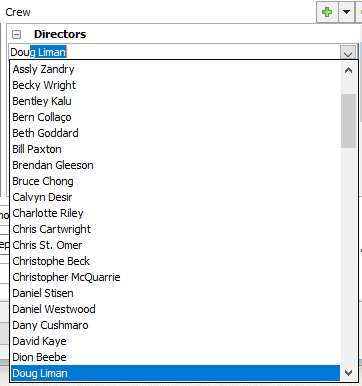 [-] Fixed changing order of actors. In certain scenarios, order of actors in movies and TV series could change, and main actors were forced out from the first positions by supporting actors. This problem was fixed in Movienizer 9.2. [-] Fixed downloading information by barcode. Several download scripts support downloading movies by barcodes. In Movienizer 9.1, barcodes weren't properly sent to the special field of the download script, which is why the program fell back to the far less reliable title lookup. Movienizer 9.2 works with barcodes in download scripts correctly. [-] Fixed downloading Dune catalog patterns in the extended mode. The older versions of Movienizer offered a set of several basic patterns for Dune movie catalog, and additional patterns could be downloaded from the site and installed manually. In Movienizer 9.1, patterns could be downloaded dynamically, so it became possible to download and install required files in one click. But there was an issue when downloading patterns in the extended mode. This issue was fixed in Movienizer 9.2. 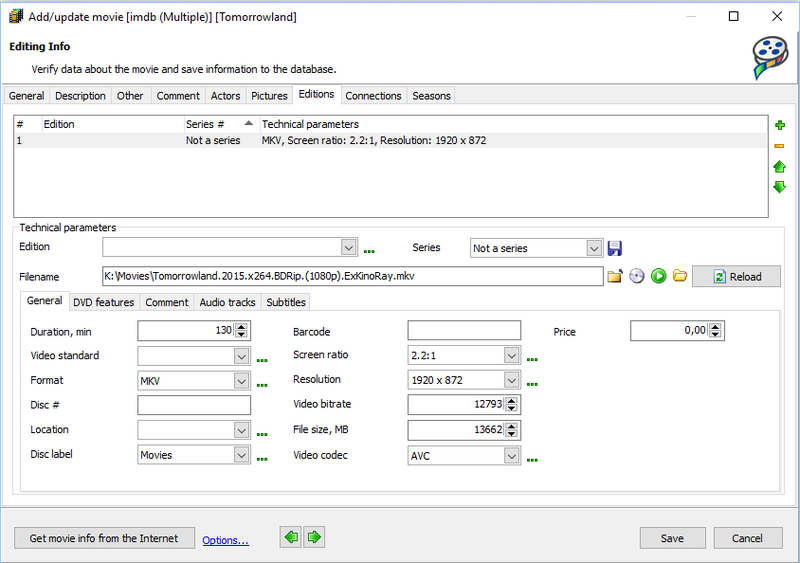 [-] Fixed clearing fields on the editions tab when reloading video file parameters. On the Editions tab you can attach video files to a movie or a TV series (if you add movies from files and folders, the video files are linked automatically). You can also refresh technical parameters of the file by clicking the "Refresh" button. However, Movienizer 9.1 could lose clear fields of the edition when you clicked this button. This was fixed in Movienizer 9.2. [-] Fixed downloading movie lists from IMDb and Kinopoisk. 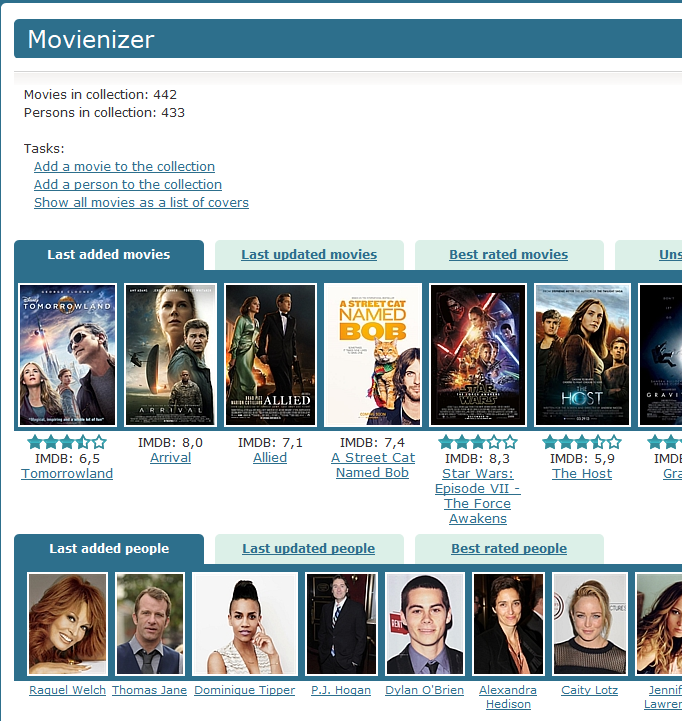 Movienizer can download already existing movie lists from sites like IMDb and Kinopoisk. This feature stopped working due to changes on the sites and was properly updated in Movienizer 9.2. [-] Fixed errors when restarting Windows without closing the program. If a system restart was initiated with Movienizer running, an error message could be displayed. This was fixed in the new version. Movienizer 9.2 includes other updates, improvements and fixes. To report a bug or suggest a new feature, visit our forum or send us a message using the feedback page.